Click here for my most recent WMFY News 2 Interview about retirement and the cost of healthcare. As one might guess, healthcare expenses grow significantly as you age. A look at the chart below shows household expenditures for older Americans. You can see that healthcare expenditures become a rising portion of the overall budget as we progress to the higher age brackets. This is logical, right? 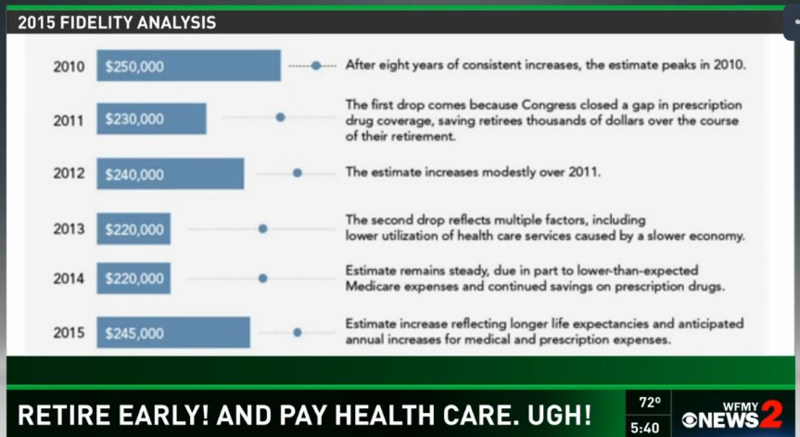 I think most people would assume this but most would not project healthcare expenses going from 8% to 19% over time. That is a large jump in overall budget and should definitely be taken into account as you plan to retire. Healthcare costs are rising again, by a lot! You can see that the average estimated healthcare expenses through retirement peaked in 2010 before dropping off in 2013 and 2014. The costs have jumped again. The jump is mostly attributed to people living longer and the higher costs on medication. These numbers are important as they can be an important factor in your retirement plan. Many Americans who otherwise are prepared to retire have found that the shocking high cost for health coverage prior to Medicare Eligibility will not allow them to retire. Many Americans, especially those who have plans through their employers do not realize the value of this benefit and are shocked at the costs of coverage that they are provided by their employer. In looking at a middle of the road plan through the exchange for a couple who are both aged 60 and non smokers, you could be looking at monthly premiums of $856 and that includes a tax credit of over $1000 a month. Your annual premiums would be $10274. For many people, that would have a devastating effect on their retirement nest egg and deplete their retirement resources very quickly. So, if you plan to retire early make sure to do a little extra homework if you plan to retire prior to age 65 as you may find health coverage to be a major roadblock. As you can see, health care is a very important part of the plan and needs to be taken into account as it is a big factor in retirement spending. Be sure your plan is up to date and accounts for a high and rising amount of health care costs to properly plan your future.